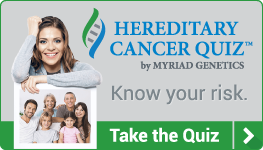 mySupport360™ is a website that helps you find comprehensive information about hereditary cancer syndromes – what they are, what the risks are and what patients can do. Today, you have access to unique genetic tests that predict your risk for developing hereditary forms of breast, colon, endometrial, ovarian and other types of cancer. Once you know your risks, you can work with your personal healthcare professional to make confident, proactive decisions about your health and that of your family. It is our mission to provide guidance, education and support through the hereditary screening process. Are you ready to get started? Visit mySupport360.com to learn more.